The Memorial Candle Program has been designed to help offset the costs associated with the hosting this Tribute Website in perpetuity. Through the lighting of a memorial candle, your thoughtful gesture will be recorded in the Book of Memories and the proceeds will go directly towards helping ensure that the family and friends of M. Louise Aho can continue to memorialize, re-visit, interact with each other and enhance this tribute for future generations. 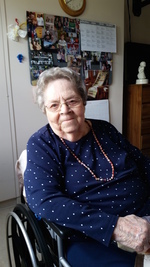 Louise Aho went home to be with her Lord and Saviour on April 7, 2018. She passed away at the Houghton County Medical Care Facility where she had been a resident since November, 2011. She was born Myrtle Louise Archer on February 6, 1920, to Jacob and Laura Archer in Adams, TN. Louise graduated from Hopkinsville High School in Hopkinsville, KY, and began her working career as a bookkeeper for RC Owens Lumber CO. She met her future husband, Weikko Aho, on a blind date while he was stationed at Camp Campbell, KY. They were married in Hopkinsville, KY on February 8 1947, and moved to Detroit, MI. In 1951 they moved to the Copper Country, eventually settling on Tamarack Hill, where they lived for over 40 years. Louise was a dedicated and long time member of Bethany Baptist Church in Dollar Bay where she taught Sunday School, served as the church secretary and treasurer, and was an active member of the Ladies Missionary Circle. Louise was a dedicated Mother and homemaker, and resumed her career outside the home when she and Weikko owned the Finlandia Restaurant and Bakery in Hancock. Following their sale of the Finlandia, she worked for Upper Peninsula Power Co, and for Bay Lumber and Supply in Dollar Bay, retiring in 1982. After retirement Louise and Weikko spent much of their time gardening, picking berries, and canning all of the fruits of their labor, which she was so generous with. Many hours were also spent making rag rugs, which many family and friends still have and will cherish for years. Louise love of quilting has blessed all of her children and grandchildren with handmade quilts that will be treasured for years to come. Louise was preceded in death by her husband, Weikko, her parents Jacob and Laura Archer, two sisters, Mary Rogers and Verley Archer, and three brothers, Edwin, Forrest, and Whitman Archer. She is survived by two sisters, Alice Jones of Lexington, KY, and Joan (Calvin) Gibson, of Cincinnati, OH, her three sons, Roy (Suzanne), of Keller, TX, Duane (Karen) of Dollar Bay, MI, and Tim (Angela) of Crystal Falls, MI. 6 grandchildren, Christopher (Natalie) Aho, Oxford, NC, Jeffrey Aho, Apopka, FL, Bradley (Rebecca) Aho, Keller, TX, Heather (Ryan) Bishop, Duluth, MN, Ryan Aho, Duluth MN, and Amber Faught, Bath, MI along with 12 great grandchildren and numerous nieces and nephews. Her family would like to thank the staff at Houghton County Medical Care, and in particular, the first floor nursing station for the wonderful care they have provided. We would also like to thank Dr Trusock and his staff for their care and attention. Visitation will be Friday April 20th from 4-7pm at the Erickson Crowley Peterson Funeral Home. There will also be visitation from 10-11 am Saturday April 21st prior to the funeral. The funeral will be held at the Erickson Crowley Peterson Funeral home on Saturday, April 21, at 11 am with Reverend Christopher Aho (Grandson), officiating. The family requests in lieu of other expressions of sympathy, donations in the name of Louise Aho be made to Gitche Gumee Bible Camp, 5189 Garden City Rd, Eagle River, MI 49950. To send flowers to the family of M. Louise Aho (Archer), please visit our Heartfelt Sympathies Store.